Because I was born in Superior, Wisconsin, located at the tip of Lake Superior, and across the bridge from Duluth, Minnesota, I am interested in all things that have to do with that area. My family moved to Casper, Wyoming when I was three, so I was not raised in that area, but somehow, it is in my blood. I will always have roots I can feel there. We still have a large number of family members there, and we continue to get to know them more and more due to a trip back there, and continued connections on Facebook. For that family we are very grateful, because they are all amazing. As I said, I love the area around Lake Superior, and the shipping business that comes through there is an amazing thing to watch. 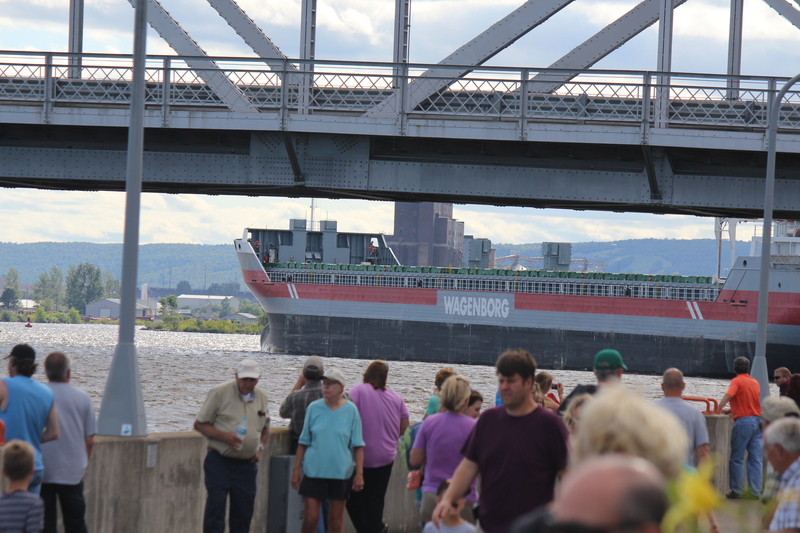 In order for shipping to thrive on Lake Superior, they had to have a way to get the big oar boats and other large ships into the port. 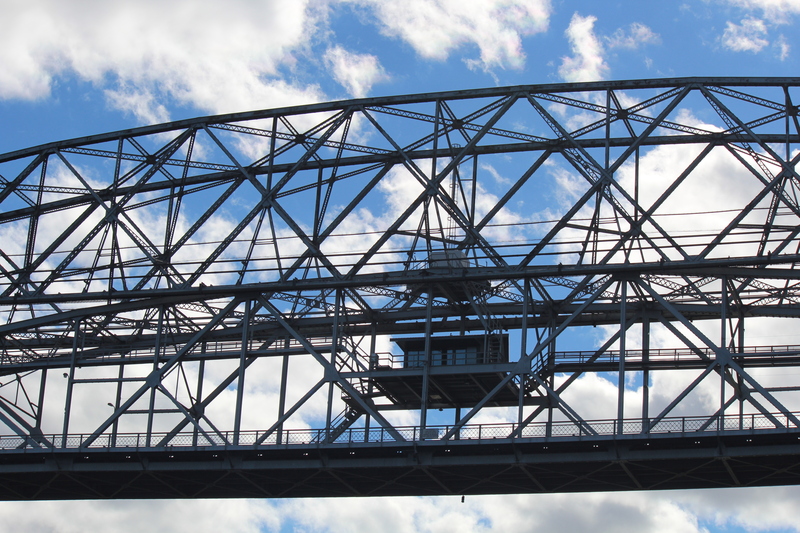 In 1892, a contest was held to find a solution for the transportation needs to go from Minnesota Point to the other side of the canal that was dug in 1871. a man named John Low Waddell came up with the winning design for a high rise vertical lift bridge. 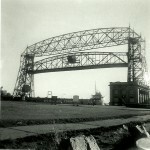 The city of Duluth was eager to build the bridge, but the War Department didn’t like the design, and so the project was cancelled before it started. It really was an unfortunate mistake. Later, new plans were drawn up for a structure that would ferry people from one side to the other. This one was designed by Thomas McGilvray, a city engineer. That structure was finished in 1905. The gondola had a capacity of 60 tons and was able to carry 350 people, plus wagons, streetcars, and automobiles. The trip across took about a minutes and the ferry crossed once every five minutes, but as the population grew, the demand for a better way across grew too. They would have to rethink the situation, and amazingly, he firm finally commissioned with designing the new bridge was the descendant of Waddell’s company…the original design winner. The new design, which closely resembles the 1892 concept, is attributed to C.A.P. Turner. I guess they should have used that design in the first place, and it might have saved a lot of money. Construction began in 1929. They knew that they had to be able to accommodate the tall ships that would pass through. In the new design, the roadway simply lifted in the middle, and after the ship went through it lowered again, becoming a bridge for cars. The design is amazing, and grabs the attention of thousands of people on a regular basis. The new bridge first lifted for a vessel on March 29, 1930. Raising the bridge to its full height of 135 feet takes about a minute. 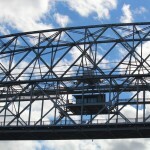 The bridge is raised approximately 5,000 times per year. The bridge span is about 390 feet. As ships pass, there is a customary horn blowing sequence that is copied back. The bridge’s “horn” is actually made up of two Westinghouse Airbrake locomotive horns. Long-short-long-short means to raise the bridge, and Long-short-short is a friendly salute. The onlookers love it, and the crews often wave as well. 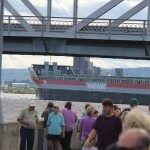 It is like a parade of ships on a daily basis, and probably the reason that the bridge is so often the subject of pictures of the area. Happy 86th Anniversary to the Duluth Lift Bridge.